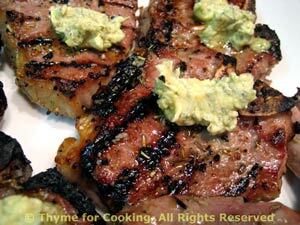 Thyme for Cooking Weekend Menu: Grilled Lamb Chops with Rosemary, easy recipes. One last meal from the barbecue grill (although we will use it for grilling meat 2 more times). Our vegetable tonight is onion - so be generous, they're delicious. Our Final Salute to Summer! If you can get large, sweet onions, like Vidalia, they would be great here. I used 2 red onions, also good! We used the same basket that we use for hamburgers. If you don't have a basket, use a mat or grill pan. They get very light and very crisp! Slice potatoes and onions thickly, 1/3" (1cm). Put the sugar, vinegar, mustard and oil into a bowl and mix well. Brush or spoon mixture onto both sides of the potatoes and onions. Lay them flat in a hinged grill basket or into the trusty pan you use to grill vegetables. If using a basket grill 10 - 15 minutes per side, or until done, part of the time over direct heat. If using a grill pan start over direct heat for about 10 minutes, turning after 5. 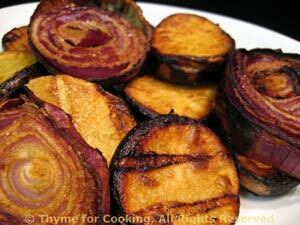 Then move to indirect heat for 10 - 15 minutes, or until vegetables are tender and nicely browned. Note: Could be roasted in 425F (210C) oven for 30 minutes, turning once.